Description of Task: Install a concrete encasement. The total length of encasement is 20 to 30 feet. Reinforcing the pile is not required. Size of Crew: Dive station and two support laborers. Special Training Requirements: Familiarity with the type of concrete form jacket. Equipment Requirements: High-pressure waterblaster, hydraulic grinder with Barnacle Buster attachment, hydraulic power unit, concrete pump with adequate hose, concrete slump cone, air jetting pump and hose, rigging equipment, float stage, scaffolding. If ready-mix concrete is not available, provide a concrete mixer and wheelbarrows, shovels, etc. as needed. Form Material - Either flexible or rigid forms may be used. Follow manufacturer's recommendations regarding lengths and diameter of forms, top and bottom closures, spacers, bands, straps, and special fittings. Forms are ordered prefabricated in the required length and diameter. For flexible forms, allowance on the length must be made for extra fabric that may be required around blocking at the top and bottom of the jacket. Spacers - A conservative estimate of the number of spacers must be made. Rough water and batter piles will require more spacers. Wire Mesh Reinforcing - Usually 6x6-10/10 welded wire fabric is adequate. Width of wire required is based on its circumference, taking into consideration the thickness of the spacers between the pile and reinforcing and allowing at least a 12-inch overlap of ends. Concrete - To determine the amount of concrete required to fill the form, be conservative. Allow for reduction of concrete volume due to loss of water through the permeable fabric, enlargement of the jacket caused by stretching, and waste. Usually an allowance of 10 percent extra concrete is sufficient. If ready mix is not available, provide for hauling, stockpiling, and protecting cement, aggregates, clean water, and admixtures, and schedule extra man-hours. Form Reinforcing Straps and Special Fittings - Rigid forms usually require reinforcing straps. The spacing and number required depend on the type of form and the hydrostatic pressure of the concrete fill. Some types of reinforcing straps are reusable, but an allowance should be made for a loss of between 10 and 20 percent of the straps each time they are used. Closure forms, blocking hangers, inlet valves, and clamps will be required, the number and type depending on the forming system being used. Potential Problems: Potential ripping of fabric forms requires familiarity with repair procedures and the availability of repair equipment. Potential unzipping or unlocking of form seams requires familiarity with banding or strapping procedures with form partially full of concrete. The steel piles must be cleaned of rust, scale, and marine growth. Failure to do so would result in poor bond between the concrete and steel. It is also important to ensure that the concrete be poured within 72 hours following cleaning to ensure that new marine growth will not have formed on the pile surface. For warm waters it may be necessary to further restrict this allowed time period. The flexible-form damping and sealing arrangement on steel H-piling is more elaborate than for round pilings; blocking must be provided to fill the channel voids and provide a seal and clamping surface for the flexible form. Some examples are shown in Figure 1 of Table 5-7. Concrete should be pumped using 15-psi minimum pressure through a suitable pipe or hose which extends down to the lowest point in the form. It is important to start filling with the hose at the bottom and to keep the discharge submerged in concrete during the pouring operation. This procedure will prevent voids forming. Care must be taken when using the hose-tremie method as there is a tendency for the hose to become snagged on the wire mesh reinforcing. Some forms have built-in filling and overflow ports where the lower port is used for filling. Filling from a bottom port is preferred over extending the hose to the bottom of the form. Where a pile has deteriorated to the point where it has not lost more than 50 percent of its cross-sectional area, concrete encasement can be used to both strengthen the pile and to provide protection from further corrosion. Concrete encasement is the most commonly used method for repair of both pipe and H-piles. Concrete encasement is not suitable for severely damaged pile. For steel pile concrete encasement to be successful, the form must extend fully over the damaged pile section and continue at least 3 feet above and below the damaged pile area. Figure 5-17. Fiberglass rigid form concrete encasement of steel pile. CAUTION Although much of the damage to steel piling is found in the splash zone and just below MLW, partial concrete encasement in these areas alone can result in accelerated attack just below the encasement. 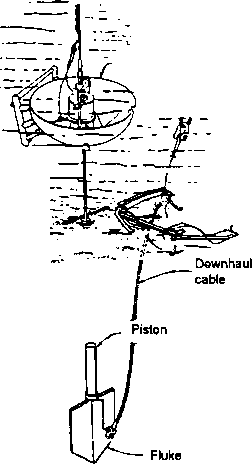 Therefore it Is recommended that the encasement of pilings extend to below the mudline as shown in Figure 5-17 in order to avoid accelerated attack. Encasement should extend as a minimum from 1 foot above MHW to 1 foot below the mudline. If a partial encasement is used below the splash zone, then a cathodic protection system should be installed to prevent the accelerated corrosion just below the encasement. The cathodic protection may be achieved by either attaching sacrificial anodes to the piling or through an impressed current cathode protection system. Concrete encasement is also used as a corrosion and abrasion protection technique for piles in the splash zone. If the encasement is only in the splash zone and does not extend below MHW, accelerated attack due to the partial encasement will not occur. By itself, concrete encasement will not restore the full bearing capacity lost due to deterioration of the steel cross section. Although not general practice, increased bearing capacity may be gained by bolting steel angles or channels to the piles along the damaged section before the pile is encased in concrete as shown in detail on Figure 4 of Table 5-7. Above water the reinforcement may be welded to the pile. Care must be exercised to ensure that the connections are made to sound metal. Damaged sections of H-piles (and piles of other shapes) can be repaired by replacing part of the pile. 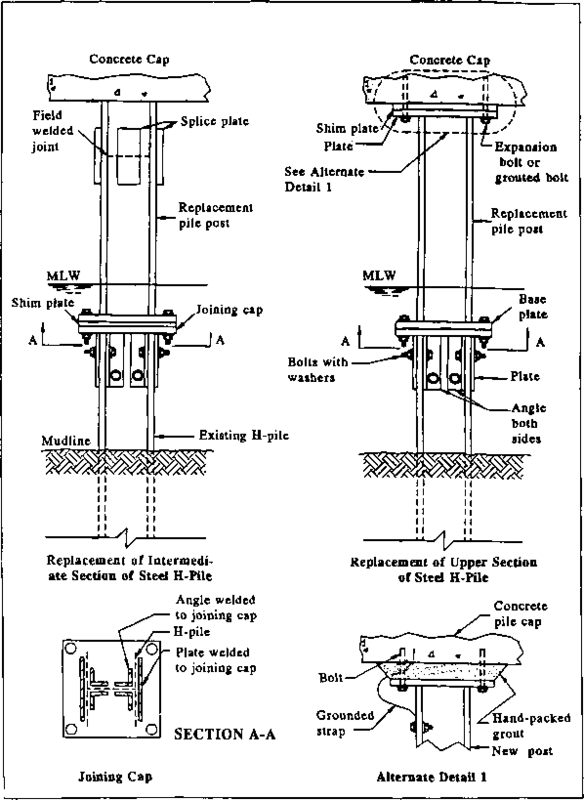 The technique involves cutting out the damaged section and splicing in a new (in-kind) section of H-piles as described in Table 5-9. Planning and estimating data are provided in Table 5-10. Partial replacement can restore a significant portion of the structural strength lost in the deteriorated section. The success of strength recovery will depend upon the care taken to align the new section with the existing structural members. Structural analysis is required to evaluate loading conditions and for sizing the structural repair elements and to determine the structural capacity of the repaired pile and attendant structure. During the repair procedure, temporary deck supports may be needed to transfer the load from the pile being repaired to adjacent piles. A major concern with partial replacement is corrosion. The new steel will be anodic to the old steel when first installed. All new metal should be cleaned and painted before installing. The need for installing local cathodic protection should be reviewed by a corrosion engineer. Encasing the replacement section in concrete using the procedures described in Section 5.5.1 would provide an acceptable alternative to eliminate corrosion problems. Concrete encasement needs to extend from above the HWL to 1 foot below the mud-line to prevent accelerated corrosion occurring below the encasement. • Brace surrounding structure to adjacent piles. • The damaged section of pile is cut out at an elevation where the pile is of sufficient cross-sectional area to support the anticipated loading. Cutting methods are discussed in Section 2.4. It is important to be sure that the bottom and top cuts are square. • A joining cap is fabricated by welding steel angles and plate to a steel bearing plate as shown in Figure 1 of Table 5-9. The joining cap is mounted and bolted to the lower section. • A new H-pile section is then cut to fit the missing length with a steel bearing plate welded to the bottom. Holes are drilled in the bearing and shim plate to match the joining cap. Problem: Moderate to heavy deterioration - greater than 35 percent of the cross-sectional area of the H-pile is damaged. Description of Repair: Remove damaged section and add new section. CAUTION: Rope off upper deck to prevent vehicles transiting repair area. • Clean growth and loose rust. Install temporary supports as required to support pier during repair. This may include installing temporary piles adjacent to repair area or bracing deck to adjacent piles. • Cut out the damaged section being sure ends are square and grind smooth. (1) Joining cap as shown in Figure 1 and a bolt pattern template for later use in fabrication of shims. (2) A 1-inch-thick plate (minimum) with holes match-drilled to joining cap. Weld plate to new pile section. • Drill mounting holes in lower pile section using joining cap as template and mount joining cap using appropriately sized nuts/bolts and lock washers. • Fabricate replacement H-pile section with the 1-inch plate welded on one end. • Install new section in position with nuts/bolts and lock washers. Use welded splice plates to join replacement pile to existing upper pile (above HWL). • Fabricate new section to fit under concrete cap and weld 1-inch plate at both ends. • Install new section. Loosely bolt lower bearing plate to bottom section using shims as necessary. • Attach to pile cap. Use expansion bolting or drill and grout to concrete, or lags to timber cap. • As necessary, hard pack grout to fill void and allow to fully set. • Tighten lower and upper fasteners. Note: This method restores the structural strength but corrosion is likely to occur at uncoated sections. 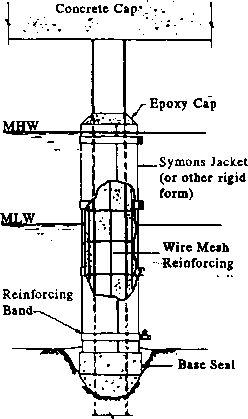 The repaired section may be encased in concrete to extend life expectancy. What happen if steel in concrete pile rust? How to repair marine pile?